2-in-1 Portable Device Charger and Emergency Battery. Working with a Europe-based startup and engineers in China, we created Thino, a portable device charging accessory with dedicated small portable battery. The product went through a successful crowdfunding campaign at Indiegogo. In today's world of various portable smart devices, carrying charging cables and external batteries have become a necessity. Even the external batteries need their own charging cable. We have ended up becoming slaves to limited battery lives and an endless search for sources of USB ports. We wanted to find a way to provide a different solution to our battery hungry lives. Inspired by the actual user experience of charging devices, Thino offers a comprehensive solution with a comforting experience. 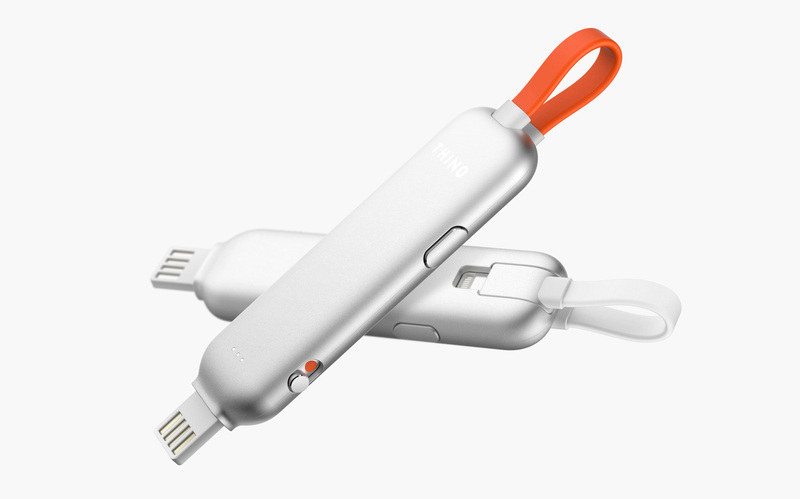 By combining a regular charging cable with an integrated small portable battery, Thino is a unique solution for portable devices. 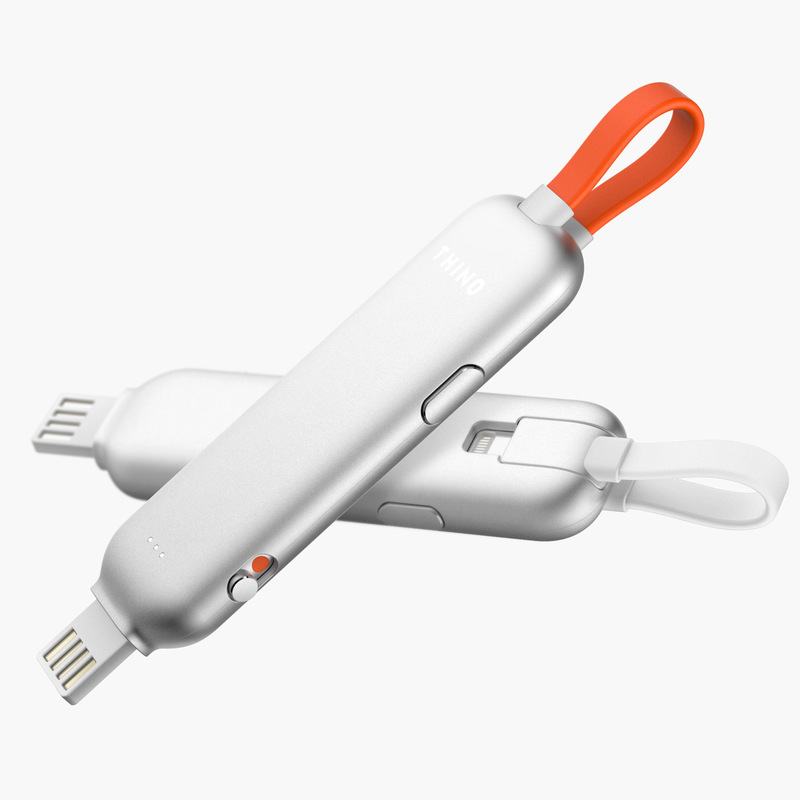 People can use Thino as a standard charging cable normally, and the internal small battery is always there to give a small boost in charge when needed. A turbo-charge switch feature cuts off data transfer in order to dedicate all of the power to charge the device as quickly as possible. Durable aluminum body with effortlessly functional hook. Thino's soft round shape combined with highly durable and lightweight aluminum gives users a wonderfully tactile experience. Its small size fits comfortably in your hands and the semi-glossy finishing of the aluminum is delightfully smooth to the touch. We have added a very secure and seamless portability to Thino. The band lock mechanism wraps into a loop at the end of Thino, so that it can be hooked onto anywhere. The fail-safe dual quick release switch allows easy unlocking. No more desperately fumbling with tangled charging cables. The best part is that the band itself is the charging cable, therefore the whole process of plugging in your device becomes effortless. Following through to development and manufacturing. In addition to Thino’s Product Design, we also worked with mechanical and electrical engineers from the manufacturing factory in China for product development. Our role involved making iterative design updates and overseeing design and working prototypes for testing. Creating a clean and bright visual identity in parallel. Creating a clean and bright visual identity in parallel. Along with Thino’s product design, we also created Thino’s identity and collateral. This involved its visual marketing material like the logo design, color scheme, web design, 3D animation, and commercial filming. The logotype is a bold and confident lettering, with a specially modified letter “N” that is reminiscent of the charging capabilities of Thino.